Korea Travelogue: 2D1N Jeju Island Travel Guide. 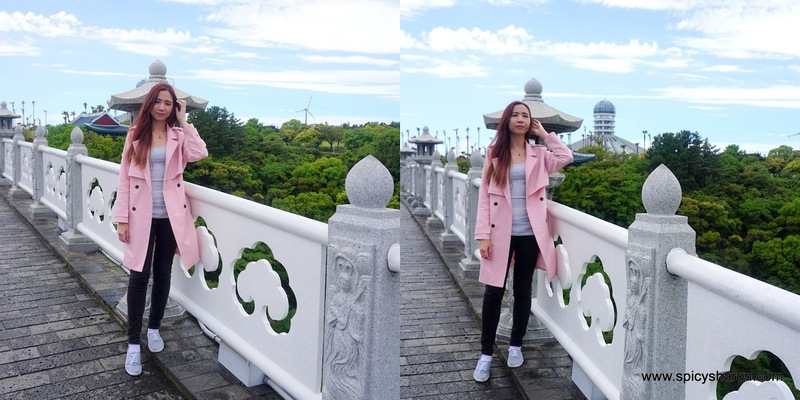 Today’s writeup features some of the most gorgeous scenic locations in Jeju Island, and also the most eventful day I’ve had throughout this trip. This is also the last writeup of my 6 part Korean Travelogue series. In chronological order of events – from Seoul to Jeju Island. 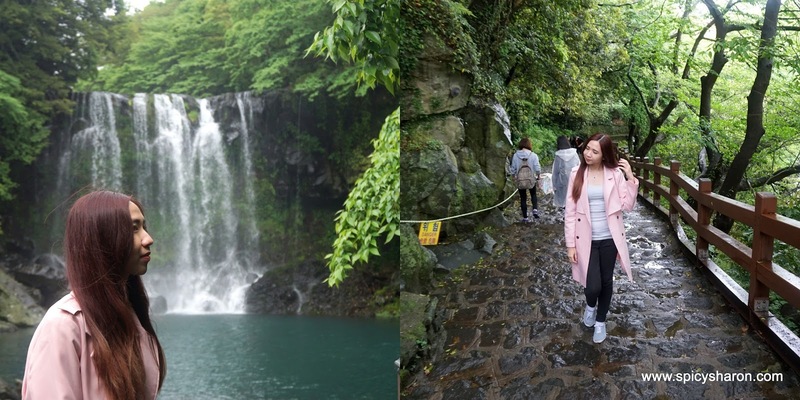 Follow my Jeju footsteps! To be honest, I was quite worried of hopping off the wrong stop and getting lost. It would take about 15 minutes walk from the bus stop to my accomodation, so I knew that it was not that straightforward. With only a printed map in hand, I got the help of few locals to direct me to the right location and I arrived safely at Preun Jeju Pension. Yay! 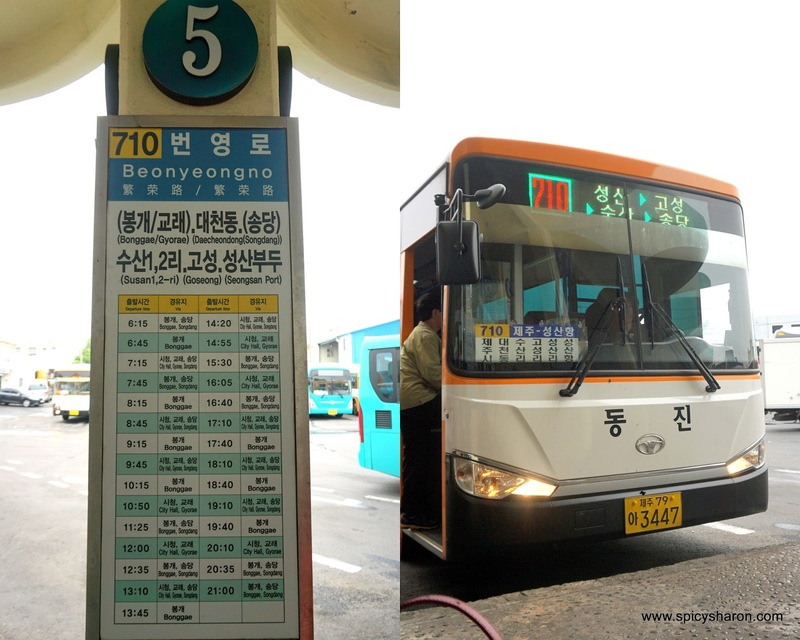 Very Important Tip: Email the hotel and request for detailed bus instructions – in English and Korean. If there is a need to ask a local for help, the Korean version would come in very handy. Having said that, only certain major hotels have official websites and offer email correspondence upon booking online. The smaller ones normally don’t. 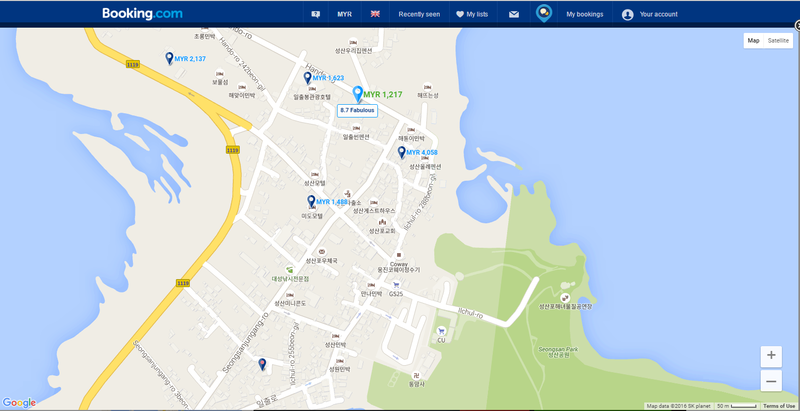 In my case, I had to do a walking map of how to get from Breeze Bay Hotel to Preun Jeju Pension. Booking.com have a fantastic route map which I referred to. Remember to print out all essential maps! Once of the best place to stay near Seongsan Sunrise Peak (must see!) is Preun Jeju Pension, where I stayed for one night KRW45,000 (RM152) and my booking was made via Booking.com. I paid for my stay by cash. Preun Jeju Pension is run by a very friendly Korean lady, who speaks very limited English. The place was very clean, facilities ample, location great and more importantly, value for money. The pre-booking part of this trip is higlighted in a yellow box. Taken from the balcony of Preun Jeju Pension. With glorious views of the Seongsan Sunrise Peak.With some spare time in hand before nightfall, I wandered around the area, taking in all fresh air I can. The weather was perfect! I found a fantastic spot to chill near the cliffs, with fabulous views of Seongsan Sunrise Peak. I marvelled at the sight of all the greens and blues, with sounds of waves gushing at the background and the calm wind blowing swiftly. The feeling was amazing! I spend the next half an hour just staring into the sky and finally my stomach started grumbling and I knew that it was time for some Korean dinner. Our appetizer for that evening came in the form of a wholesome bowl of Abalone Porridge (KRW12,000). We were saving tummy space for our main course later, so we ordered one portion to share, even then, portion came massive. 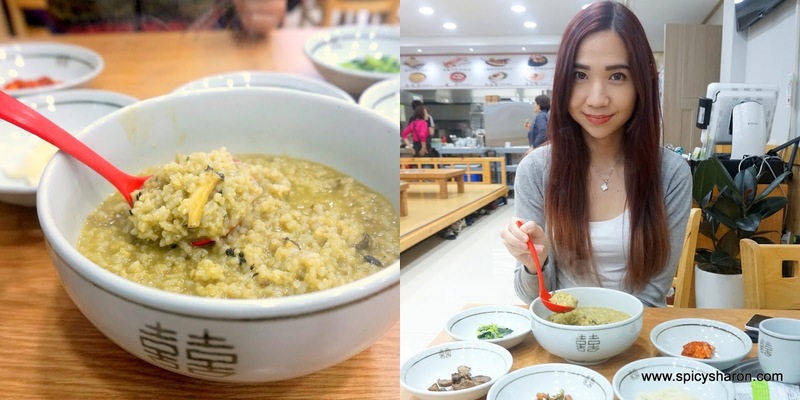 There were generous slices of abalone inside and the porridge was yellowish in color, much more fragrant than the standard ones I was accustomed to, and slightly more grainy in texture. 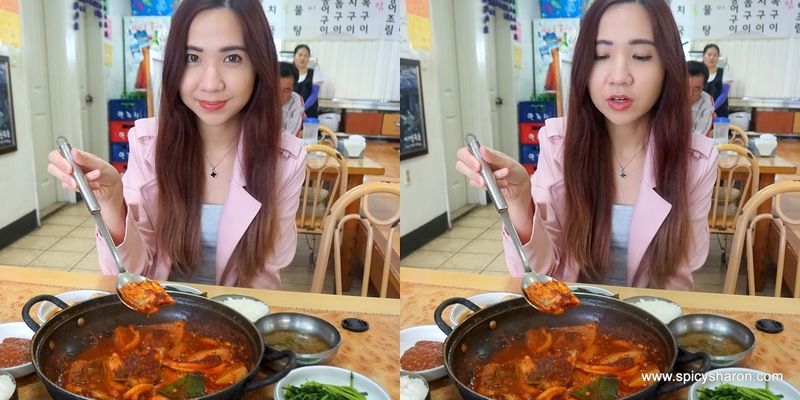 Next, we walked to a nearby restaurant, ready as ever to feast on one of the must eat food in Jeju Island – black pork. As though we have not eaten for an entire day, we ordered two portions of Grilled Black Pork (400gm at KRW36,000) and one portion of Marinated Grilled Black Pork Ribs (300gm at KRW13,000). This meal was easily one of the most expensive yet fulfilling one I’ve had throughout my Korean trip. With only 4 hours of sleep, I woke up at 2.30am the next morning and got ready for a long and eventful day ahead. Yes, the real journey starts now. The plan was to leave the accomodation at 3.30am and start making my way up to Seongsan Ilchulbong Sunrise Peak at 4.30am, just in time to catch the sunrise time at 5.30am. All hail broke lose when I heard loud thunderstorms and splattering of rainwater against the glasswindows. I have to admit however, I was very stubborn (no – we – both me and my friend). I conciously knew that there will be no sunrise if it rains, but I was still hoping that it will stop just in time. I brought nothing along with me apart from a bottle of water, an umbrella and my camera, and stepped out into the rain. No map, no money, no phone, just me – some guts and bare hope. After what seemed like a neverending series of unecessary events (which I won’t be able to cover all of it in this writeup), I made my way up to the peak. The hike to the peak was relatively easy, it took about 30 minutes in total, with impromptu photography pauses in between. No sunrise as expected, but mission accomplished, plus some foggy view of Seogwipo-si. By the time I was done, it was already close to 6.30am. I bought some pastries and hot tea from Paris Baguette Cafe (yes, we walked back to our place to get money) and hurried back, washed up and checked out before the driver arrived at 9am. For my second day in Jeju Island, I pre-booked a private driver upon recommended, for KRW130,000 (Rm520/day). You can, alternatively rent a car, at KRW120,000 (Rm400/daily), alongside a valid international driving licenses (Rm150 for 5 years validity). Since I’m horrible with directions and my friend terrible in driving, hiring Mr Kang (Phone: +821036922030) really wasn’t an option – it was a necessity. Don’t bother with travelling via public transport – it’s virtually impossible with the language barrier and an essential waste of time. Mr Kang was a marvelous host. In fact, he was inspirational to me. At 55, he speaks pleasantly fluent English, though he only started learning the language 6 months back. I sincerely admired his will to learn something so new, yet progressed so quickly, even at that age – truly inspirational. To add, not only did he drove us around, he accompanied us on most parts of our tour, explaining to us the historical significance behind each attraction, and doubled-up as a great photographer too. Please give him a beep in Jeju! Now, with only one full day to explore Jeju Island, my plan was to only cover the must visit places in Jeju. I will be travelling Jeju in a loop (East > South > West > North), then back to Jeju City. Scroll to the end of this post for my Jeju City itinerary map. Now, weather was not on our side that morning. It drizzled. It stopped. It drizzled then stopped. We were told that showers were quite frequent in the month of May, so remember to check the weather forecast prior to making a booking. First selfie in the car! Now, Jeju Island was defined by volcanic landscapes that formed beautiful volcanic craters and lava tubes, to what Jeju Island is today. Henceforth, most of the scenic attractions here are either – mountains, caves, cliffs or falls – I think I’ve just name it all. First stop, Mt. Seopjikoji. Before I knew it, it was already lunch time and we dropped by one of the more popular Korean restaurant in Seogwipo-si. The place was packed when I dropped by. It is located about few minutes drive from the entrance of Jeongbang Falls. Again, with no English name in sight, I hope the Korean signboard below would be an ample guide. Fulfilling my Famous Food To Eat In Jeju Island list, I ordered the Spicy Hairtail Fish Stew (KRW24,000) for 2 person, upon recommendation. The stew was fiery, though extremely hearty and came with 4 humungous chunk of fish, potatoes and radish. So good, especially on a raindy day! With tissues in hand, it wasn’t difficult to polish everything up. Rushing for time, we dropped by Oedolgae, which was not in the initial itinerary, but recommended by the driver, since it was not far away from where we were. Oedolgae Rock is essentially – a rock, which I honestly do not know how to appreciate. Mr Kang was kind enough to explain to me the legend behind the rock – of an old woman who turned into a rock while waiting for husband to return from sea – just like that. After the history lesson, it’s still, just an upright rock to me. Of the many scenic attractions that I visited today, this was the most crowded, bustling with crowds of school children on field trips. The place is also one of my favorites in today’s journey. Gorgeous! At Cheonjeyeon Falls, there’re 3 waterfalls and 1 arch bridge in total, so expect to spend some time here. The entire area stretches about 1km in distance. I visited the first and second waterfall but had to forego the third waterfall (the furthest) due to time constraint. This is also one of my top favorites of the day and I’d highly recommend visiting – maybe I just really liked the soothing and relaxing sounds of waterfalls. My friends have been raving about this place for months. They say, the green tea desserts here are fabulous! 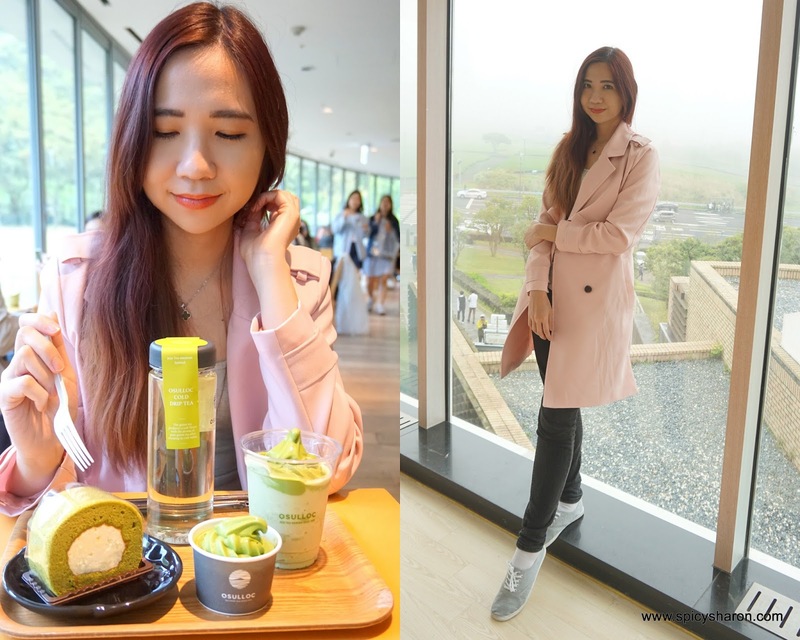 Knowing that I will only be here once, me and my friend overstuffed ourselves with 3 desserts, Jeju Greem Tea Ice Cream (KRW4,500), Green Tea O’Fredo (KRW7,000) and Green Tea Roll Cake (KRW5,000). Perhaps it’s the overall experience of just being there and having freshly brewed green tea desserts which made all of this thoroughly enjoyable. Delectable! Before I knew it, I reluctantly hop on the car and left for Jeju Airport. It was already 5pm and I had a flight to catch at 6.30pm. 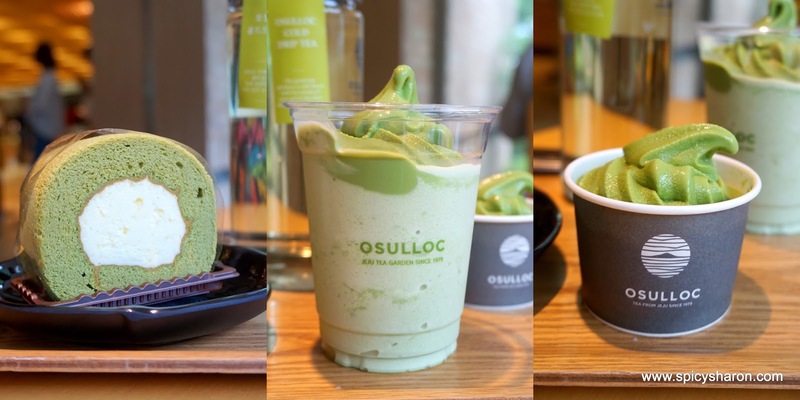 Jeju Airport was about 30 minutes away from O’Sulloc Green Tea Museum. The rain have stopped but the weather was very foggy at Jeju City that evening. We were travelling at about 40km/h. Matter of fact is, I was more excited of being part-of-the-fog (it was my first time of such experience) than worried about a flight delay or cancellation, something which is exceedingly common here. 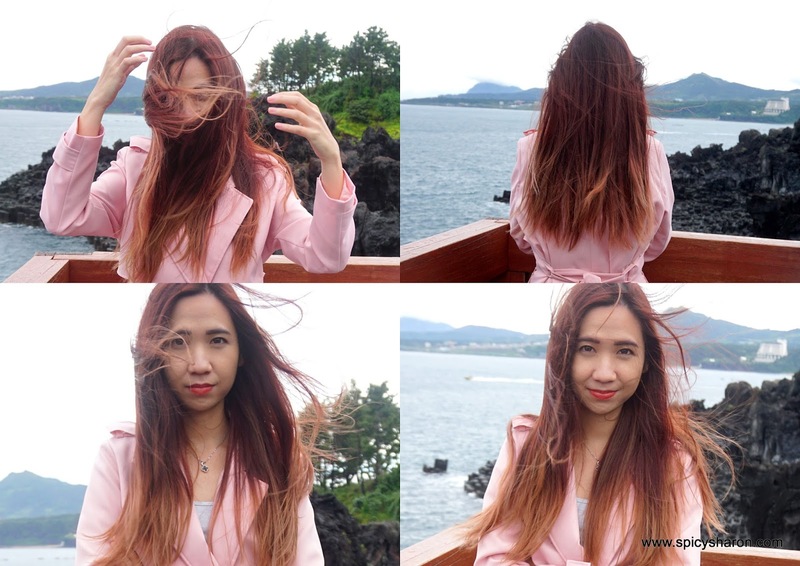 Despite the daunting weather, the journey in Jeju Island was definitely a memorable one for me. This is the last of my Korean Travelogue series. I hope you had as much fun reading as I did writing. More importantly, I hope these writeups would prove informative to the planning of your trip. I can’t wait to plan for my next trip! 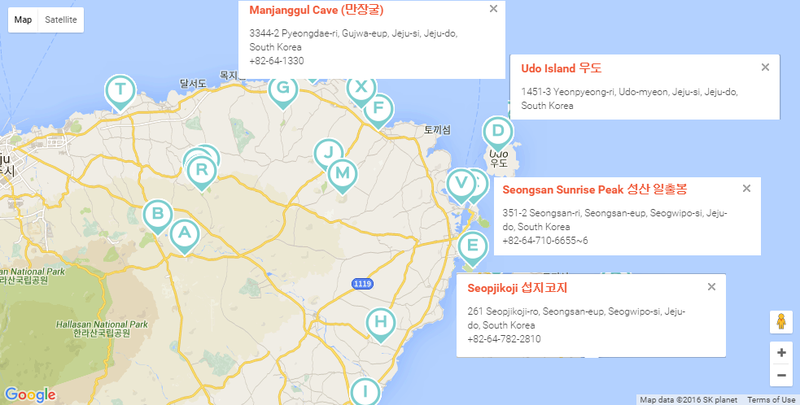 Click this image for Trazy reference of other places to visit in Jeju West Coast. 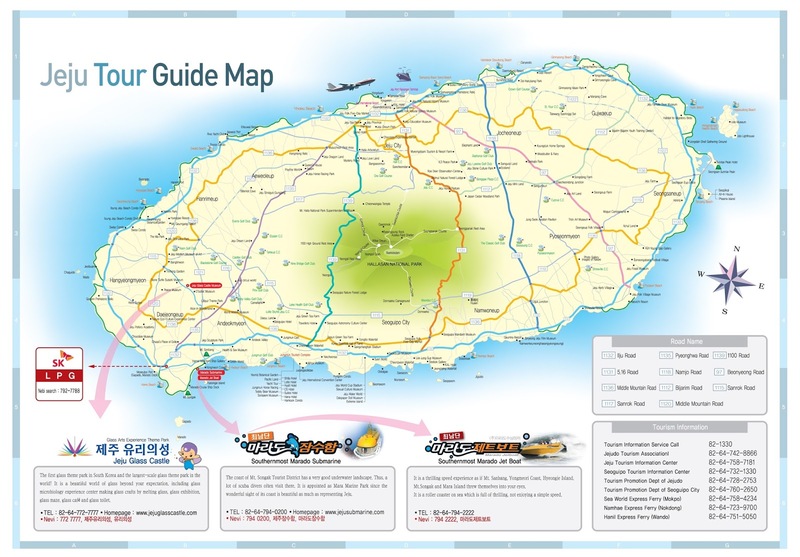 Click this image for Trazy reference of other places to visit in Jeju East Coast.